NACS offers faculty and staff the option of receiving a printed campus directory. To manage costs and conserve resources, NACS wants to ensure that copies of the printed directory are sent only to those who require them. To receive a printed directory, you must request one at the directory update web page. NACS thanks those who elect to “go green” and use electronic alternatives. After logging in, check “Yes” under the question: “Do you want one (1) copy of the printed UCI Campus & Medical Center Directory?”. You may also use this link to update your other directory information. Please note NACS distributes only to faculty and staff on the main campus. Medical Center personnel have their own distribution mechanism. The on-line directory has been recently enhanced to offer a wider and more flexible range of search criteria, including the ability to limit searches to faculty and staff, students, or department names. 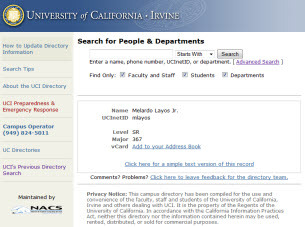 The “Advanced Search” makes it easier to search based on first name, last name, UCInetID, department, or phone number. You can also combine those criteria for more specificity. NACS is working with Sprint Nextel to improve Sprint PCS coverage on the main campus. Sprint Nextel is adding Sprint PCS equipment to the existing Nextel site located at Engineering Tower. This should improve in-building coverage for Sprint where it has been poor. NACS and other campus departments are also working with AT&T (formerly Cingular) to construct a new cell site that will be located on the rooftop of the Science Library. This site will bring coverage to the western portion of the campus in an effort to restore coverage to UCI’s AT&T users. Cingular sold their interest in the joint venture network to T-Mobile when Cingular bought AT&T Wireless assets a few years ago. Since then, their two sites on campus have only carried T-Mobile traffic, which had a negative impact on AT&T/Cingular coverage at UCI. In addition to these two projects, NACS is developing a “master plan” for future cell site installations to bring new carriers on board, and add better coverage to existing carriers that have sites on the campus. One idea that we are evaluating is a distributed antenna system or DAS. This system, installed by a third party, leverages advances in technology to deploy small “microcell” nodes that are fed by fiber optic cable back to a central distribution point on our campus. The DAS system has a very small profile compared to the sites that exist on campus today. This solution can work better in our environment, improving in-building coverage and adding carriers without the challenge of finding a rooftop or other space for several hundred square feet of equipment and large antenna arrays. In some cases, the antennas can be completely hidden, with attendant aesthetic benefits. In this information age, NACS understands the desire of many to be mobile, whether it’s simply a cell phone, PDA, or data card for their laptop. We will continue to work with cellular carriers to implement better coverage on campus.